Last month Cisco announced “Deeper visibility and control over endpoints and network access” via AnyConnect 4.2. It does this by using the new Cisco Network Visibility Flow Protocol (nvzFlow). The new nvzFlow (pronounced “en-vizzy-flow“) has some excellent details. Today, I’d like to outline a few of the advantages of nvzFlow support that we recently added to our IPFIX collection system. With nvzFlow, IT administrators can now answer more of the unknowns about the traffic happening on their network from unmanaged devices. For example, most IT admins want to know where users are accessing SaaS services. In addition, most would want to know what services are being accessed from a given location. Knowing if the device is company-owned or BYOD is also important, as is determining if an approved version of an application was being used to access various services. Convey information directly related to the five key visibility categories. Be clear, obvious, and of high value to an IT administrator. Be useful to analytics, while not requiring the use of analytics (raw-data value). Easily obtainable information across a wide variety of OS and device types. This means that you should have minimal network performance problems when sending these details in your flow datagrams. 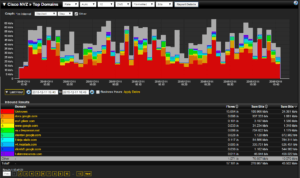 The only problem you may face now would be a NetFlow/IPFIX collector that can’t report on these new metrics. Most state-of-the-art collectors, though, will provide options for these types of reports. I’ve included a list of the elements that Cisco supplied for reference. As you can see, the elements are quite remarkable, especially for gaining insight into remote employees traffic details. [ E, I, F (M) ] nvzFlowUDID octetArray / Identifier 20 byte Unique ID that identifies the endpoint. [ E ] nvzFlowLoggedInUser string / default This is the logged in user on the device, in the form Authority\Principle. This is different from userName (id: 371), which is user associated with the flow. [ F ] nvzFlowProcessHash octetArray / default SHA256 hash of the process image on disk associated with the flow. [ F ] nvzFlowParentProcessHash octetArray / default SHA256 hash of the process image on disk of the parent process associated with the flow. [ F ] nvzFlowModuleNameList basicList of string / default List of 0 or more names of the modules hosted by the process that generated the flow. This can include the main DLLs in common containers such as dllhost, svchost, rundll32, etc. It can also contain other hosted components such as the name of the jar file in a JVM. [ F ] nvzFlowCoordinatesList basicList of float32 / default List of 32bit floating point values representing Accuracy, Latitude, Longitude, [Altitude] respectively. Altitude is optional. Coordinate based location information such as GPS, Wi-Fi Approximation, etc., Accuracy in meters – defines the error margin. [ F, I (M) ] nvzFlowInterfaceInfoUID unsigned32 / identifier Unique ID for an interface meta-data. Should be used to lookup the interface meta-data from the InterfaceInfo records. [ I ] nvzFlowInterfaceIndex unsigned32 / default The index of the Network interface as reported by the OS. [ I ] nvzFlowInterfaceType unsigned8 / default Interface Type, such as Wired, Wireless, Cellular, VPN, Tunneled, Bluetooth, etc. Enumeration of network types, defined by this spec. [ I ] nvzFlowInterfaceName string / default Network Interface/Adapter name as reported by the OS. [ I ] nvzFlowInterfaceDetailsList basicList of string / default List of name value pair (delimited by ‘=’) of other interface attributes of interest. E.g., SSID=internet. If you have any questions about getting these new elements from your NetFlow/IPFIX exports, please reach out to our support team.